For months I've been meaning to give away a couple of books I have in duplicate. Yep, ordering the same book from two places is a bit stupid, but the up side is I can give one away. So leave a comment on THIS post to be in the running for the first one and I'll choose a winner (well, maybe Eddie will draw a name out of a hat) on the 1st of April. I'll give away the second book in a month or so. This time the book is a Lark Studio Series and is titled Handmade Books. Leading artists. Signature works. Creative exploration. 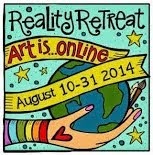 While of interest especially to book artists, I think assemblage artists may also be interested. Now for a few of my favourite things. I'm a non-meat eater so I'm always looking for simple things to eat. 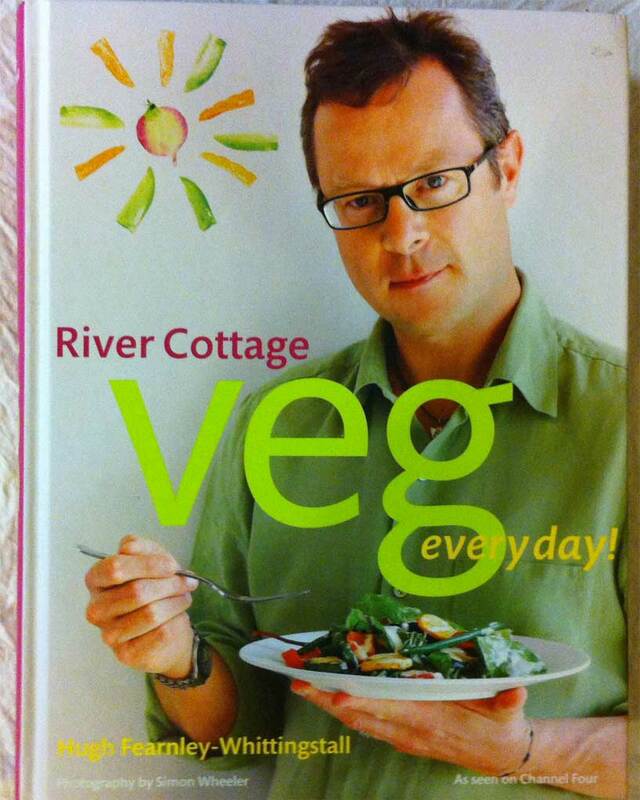 At the moment I'm enjoying Hugh Fearnley-Whittingstall's Veg Every Day. You may know his River Cottage books and TV series. Why do I follow an avowed meat eater? Well, Hugh (like Jamie Oliver) espouses good animal husbandry, demands that animals must be raised with consideration, and also believes that meat eaters should know exactly where their meat comes from and how it ended up on the plate. No punches pulled. So, while I still don't want to eat animals, I do appreciate his values. And I love his dedication to veggies. 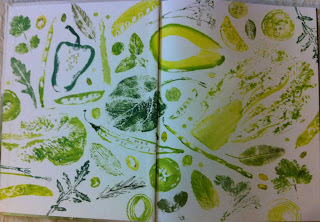 And his endpapers are wonderful. 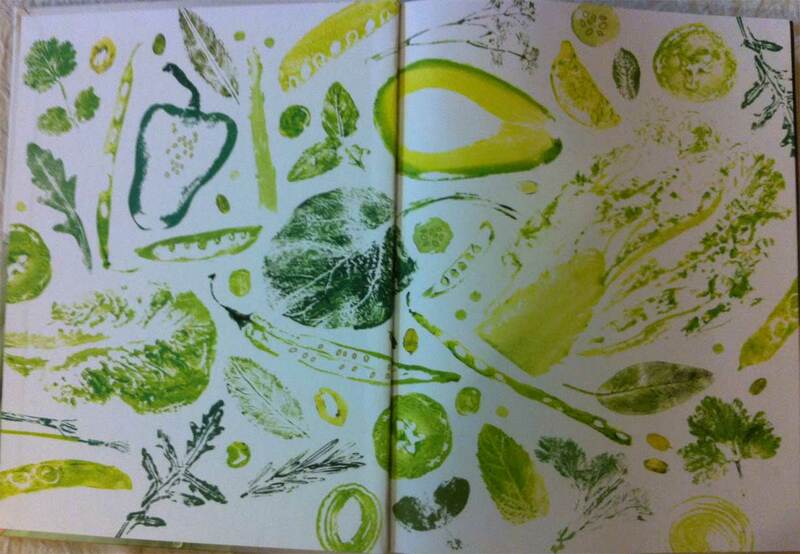 Who would have thought that veggies were so beautiful? I have some new toys. 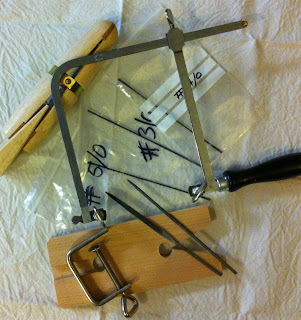 I've mentioned before that I'm about to do a sawing class (and yes, my shoulder will be able to cope - thanks to all those who sent me good wishes for a quick recovery) and it happens next Saturday at the Sydney Jewellery School. I bought some of my supplies from The Eclectic Studio, which is connected to the Sydney Jewellery School. On the left is a ring clamp; in the centre the German jeweller's saw; 3 dozen saw blades, so fragile you'd never imagine they could cut anything; a bench pin; and 2 of a set of 12 files. The reason I want to master sawing is due to Keith Lo Bue. He has made the most beautiful metal book, his first attempt at bookbinding, which takes my breath away. This link starts at the end of his process but does show the amazing (and tiny) brass book. If you like what you see, explore his blog. I actually have it in ebook form on my iPad, and I dip in and out of it constantly. I have a class with Keith in May. WooHoo! 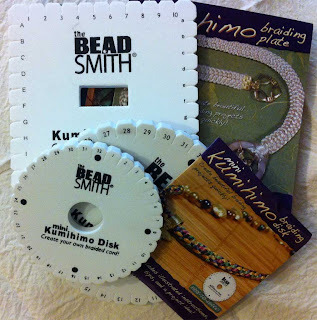 Also via Keith I learned about Kumihomo braiding, so I've added some braiding disks to my collection of tools. I think you can see from the photo how the round disks form a round braid, while the square one makes a flat braid. I bought them from Over the Rainbow, an Australian company. I've also found this rather nice shape in a journal I occasionally buy, on the rare times I feel I can afford it. It's a multi lingual floral art journal, Fleur. In a far off life I worked as a florist for a brief time - as long as it took me to realise that there was little glamour in constantly having wet hands and feet. 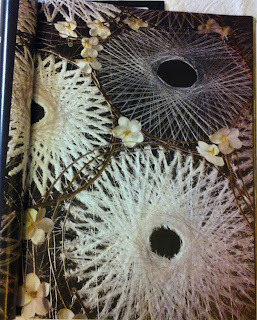 But I still love the idea of 'out there' floral art and I can get a quick fix by browsing in this magazine. 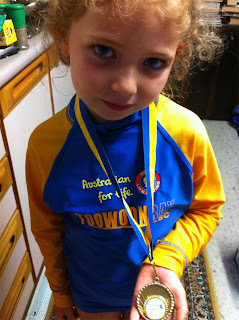 I'm a proud grandmother - you all know that, so here's Fia with her medal from Little Nippers. This is an organisation run by the Surf Lifesaving Association in Australia and is a great idea for children who need to be beach savvy. Younger brother and sister are a bit envious but were told by Fia that they'll be able to be Little Nippers as soon as they learn to "shoot a wave". As most of the population of Australia hugs the coast, it is an admirable ambition. Don't forget to leave a comment to be in the running for the book. You have until April 1.
oooo you know that I'd put my hand up rudely waving for either of those books! I'm with you regards Hugh - his 'chicken out' campaign was terrif - as has been his sustainable seafood awareness..... I like how he keeps it real for folk (... 'and now we slaughter the pig - come - look!') - and as you know I'm also a veg. Nope!It's a damn' good thing this is not an emergency line! Ronnie, you're definitely in the running for "Handmade Books". I don't think you could be rude if you tried. Fantastic that Sass can train with the AIS team. I agree that it's a great honour, he must be thrilled to bits. Somehow Di, your comment made it through. Blogger really is making it hard to leave comments. I failed one three times this afternoon and felt a real dope, as well as being crankier by the minute. Can I put my hand up too please? I am a bit of a lurker, but I am definitely interested in the book give away! 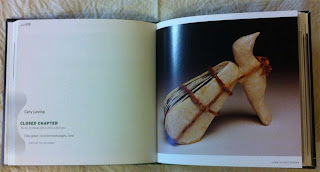 I am teaching myself bookbinding (thus why I have your RSS feed in my reader) so books like that are invaluable. Thanks for the heads up on your book giveaway! I'm afraid I'm behind on my blog reading (and writing) right now, as I'm trying to get ready to leave for San Antonio. Thanks for the blog links for vegan eating. I'm afraid I cannot go that far either, but I'm still meat-free since last September! We watched a great show on food production and what a sorry state our country (the US) is in right now, but how different areas are trying to turn things around, producing safer food, and being kinder to our animals to boot. Lovely Fia! She is growing up Carol!! Thanks for the chance to win the book. I holidayed at Bundeena when I was child,it was great!Congrats to the Nipper! The book looks marvelous. My hand is up too! Here's a daring newbie in bookmaking that would love to have that lil' book! I appreciate the chance to get my hands on it. How very generous you are Carol! This book is gorgeous, and I know whoever receives it will love it, because I own it too! I heard you bought one of the miniature books that Di shared - snap! Has yours arrived? mine is gorgeous. Great fine motor skills and eyesight. Nice blog. Nice of you to give a book away. Cheers. my goodness you have a lot here in your post.. wanted to stop by and thank you leaving a comment at my blog...no need to add me to the giveaway.. I live too far away. I haven't seen that book(lark books), don't know how I missed it. I'm very into books as you know and would love to be in the draw. I know several people who have done Keith's classes and have loved them so enjoy, I'm sure it will be great. 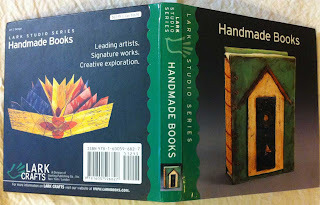 Hi Carol I finally succumbed to Blogger and made a google account so I can post here & being greedy I would love to have this book about handmade books to hold in my hands!